RemedyBG » Forums » RemedyBG 0.1.0.0 now live! #17280 RemedyBG 0.1.0.0 now live! #17282 RemedyBG 0.1.0.0 now live! It's crashing as soon as I start debugging (f5 or clicking on "start debugging"). On Windows 7 64bit. #17283 RemedyBG 0.1.0.0 now live! Thanks for giving it a shot Simon. Sorry it's not working for you out of the box. Any chance I can get a hold of the executable you are using? If not, could you possibly generate a .DMP that I could look at over here? I've been testing with various binaries, including Handmade Hero, though on a Windows 10 machine. #17284 RemedyBG 0.1.0.0 now live! #17286 RemedyBG 0.1.0.0 now live! Thanks again. I didn't see the exact crash you pointed out but I did discover a mismatch between the release version of XED and the header files I was using -- definitely potential for a crash. I posted a new ZIP containing the fix. Let me know if that helps out. If not, I'll be happy to investigate further. #17288 RemedyBG 0.1.0.0 now live! I just tried the debugger, and it seems to work just fine. Until there is support for expressions in the watch window I probably won't be able to actively use it. However, I am excited about seeing the project develop! #17289 RemedyBG 0.1.0.0 now live! Still crashing on Windows 7. I tried it on a Windows 10 machine and it was working. I tried to debug other programs but it also crashes on Windows 7. #17290 RemedyBG 0.1.0.0 now live! seventh-chord: thanks for giving it a shot! The next big push is to get the watch window / inspect window parser completed. #17291 RemedyBG 0.1.0.0 now live! mrmixer - I will set up a Windows 7 box for development but it won't be until later this weekend. I'll let you know what I find. Thanks! #17301 RemedyBG 0.1.0.0 now live! I'm also getting a crash on Windows 7 the moment I start debugging. Also the version number under the Help tab doesn't match the release notes. #17303 RemedyBG 0.1.0.0 now live! I'm setting up a Windows 7 machine right now and should have a solution for you and Simon soon. Also, I appreciate you pointing out the Help vs. release notes discrepancy. I'll make a note to correct that! #17311 RemedyBG 0.1.0.0 now live! I ran into the same problem as Simon. Debugger crashes with a 'hello world' program on Windows 7. Also a small feature request if I may - can we have control over the font size? I'm running a bootcamped Windows and on a retina display the default size is minuscule. #17314 RemedyBG 0.1.0.0 now live! I'll let you know what I find with Windows 7 -- should be sometime later today. I made a note to add a font / font size option. 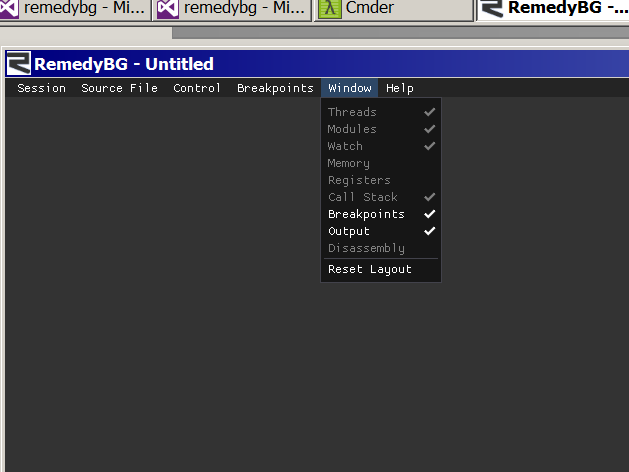 #17323 RemedyBG 0.1.0.0 now live! After many hours of setting up a Windows 7 VM and about two minutes of debugging :) I found the crash that showed up on Windows 7 (and was unfortunately suppressed on Windows 10). Turns out that in one of the calls to ReadFile I was passing in NULL for the 'lpNumberOfBytesRead' parameter. Clear as day in the documentation it states: "This parameter can be NULL only when the lpOverlapped parameter is not NULL". The fix will show up in the next release. I'm expecting sometime later tomorrow.